World of Concrete 2018 – Join us January 22nd – 26th 2018 in the North Hall at N3208 to learn more about our Stud Rail products and services. This year’s conference is expected to be one of the largest attended in 10 years! We look forward to meeting you and sharing all of our products and services. Emerald Queen Casino – September 2017 PJ’s has been awarded the second phase of EQC with SAK Construction in Puyallup Washington. PJ’s completed the 2,000 ton Phase 1 with many design and scheduling challenges that were met. Phase 2 also has it’s scheduling challenges but SAK has chosen PJ’s because are lead times even from California are significantly better than Washington fabricators. Joining Post Tension Institute and American Concrete Institute – August 2017 PJ’s joined both of these industry institutes to support the growth of our Stud Rail manufacturing and to learn what engineers and contractors need into the future to be successful. 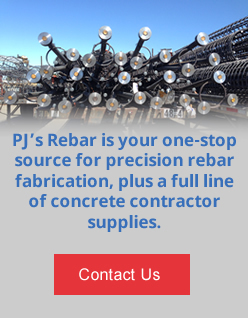 New Turlock Facility – April 2017 PJ’s purchased a 10 acre facility in Turlock that will quickly increase capacity of fabricated rebar, preassembled rebar cages and stud rails. This facility is uniquely situated to provide additional capacity into the Bay Area, easier distribution into Southern California and the Pacific Northwest.